PUT A LID ON IT!!! 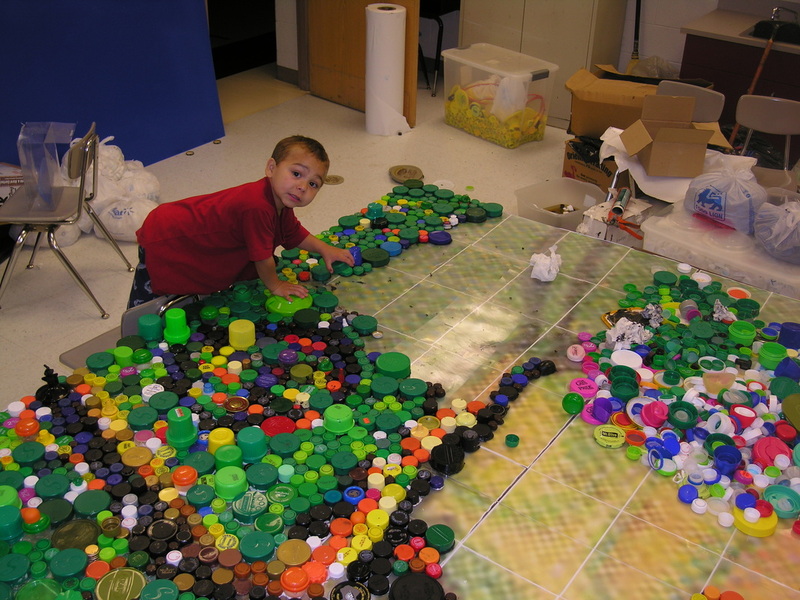 Scaleable art kits that can be purchased by schools or community groups to unite their targeted community through the process of making art out of up-cycled* plastic bottle lids. Organizations wanting a kit can purchase with funds raised by the students at special school events or through their own creative endeavours out in the community. Grants are also available for schools and groups that want to make art more accessible to their community. Definition of Upcycling: The definition of "recycling" people are now more familiar with than the term Upcycling. The difference is that to "recycle" is to take a material and process it, or break it down, so that it can be used to manufacture another product while to "upcycle" is to take a product and simply use it in something else. 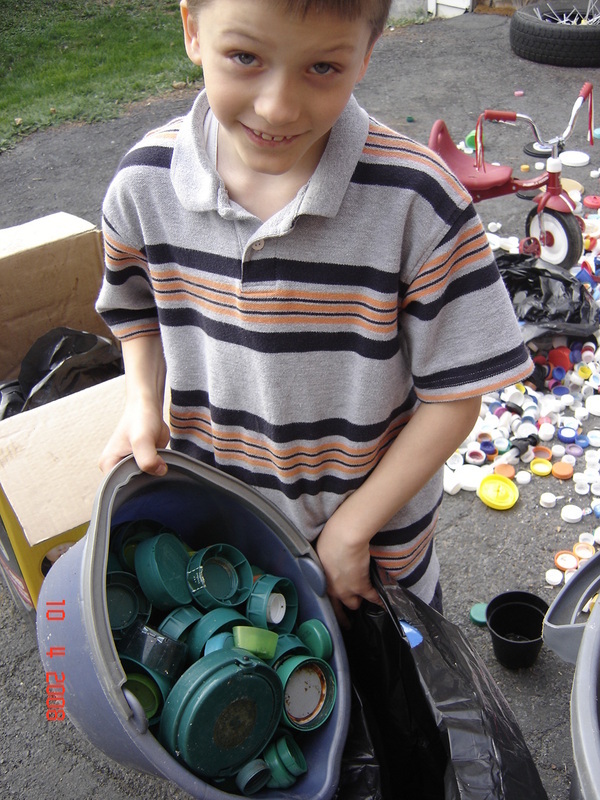 When Upcycling a plastic bottle lid, for example, viewers can still recognize it as a lid although the purpose of it may not be the same as it was originally manufactured for. For EARTHDAY or just because it's fun and creative! Earth Day 2014 will be here in a flash! David Heatwole, founder of The Arts Collaborative, invites you to make this a memorable event with an exciting artistic project that we call "Put a Lid On It - Masterpiece Art Kits." Purchase a masterpiece art kit (or two!) and work on a mural easily with your school or community organization! RECYCLE or "UPCYCLE", LEARN ABOUT ART TECHNIQUES, COLOR THEORY, TEACH ABOUT AN MASTER ARTIST, WORK AS A TEAM, DISCUSS THE ENVIRONMENT, and many more lessons. CALL TODAY to learn more about the Masterpiece Art Kit. What started as a community collaboration in the Quad-State region of West Virginia, Maryland, Virginia and Pennsylvania got the attention of citizens from as far away as California to the west and Europe to the east. This project started with just a seed of an idea and has definitely blossomed. While still growing, it is uniting people, inspiring them, and collectively we are doing something positive for the environment by saving what is in some state non-recyclable lids from going into the landfills. The project is also educating the community on the power of art and the imagination and collaboratively we are creating works of beauty for the community in which we live. I think the kits are a great way of introducing fine art tools into a school setting. So WHAT ARE YOU DOING WITH YOUR LIDS? If your answer is: “Throwing them away” then you are not alone, so are most Americans. Why? Because the lids are made of a different type of plastic than most bottles and therefore are not recycled. With millions of lids alone being dumped into landfills it is important that we think of ways to use these nonbiodegradable items. The Arts Collaborative, and artist David Heatwole invite you to save the lids! 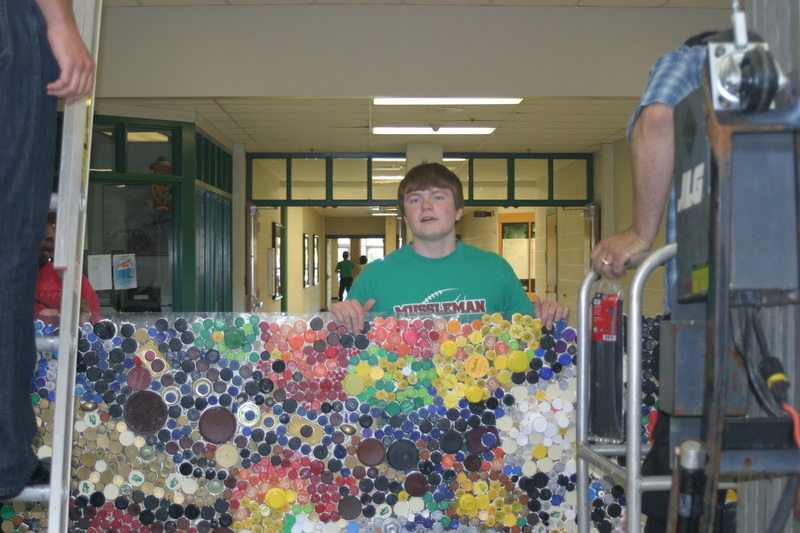 We would love for you to get involved in an exciting art project that utilizes every day house hold lids as the medium or “paint.” The outcome will be a masterpiece mural or series of murals all made of up-cycled plastic lids. The resulting look will have the look of a mozaic. And who knows what else will develop out of the process of making this work of art.